As the air begins to get crisp up here in Michigan, I start yearning for some cider, donuts and the flavors of fall. Sweatshirts, ugg boots, aaaahhh… and what’s fall without a fun, ol’ barn dance to boot? Growing up in northwest Ohio, in the middle of corn fields and barns, square dancing was quite a common thing. My favorite part of elementary school? Gym days where we got to square dance. Minus the part about having to touch yucky boys, it was one of my favorite parts of school. I also grew up playing baseball. It runs in my blood, and I love watching, playing—the whole shebang. There’s nothing better than spending the evenings at the ball field. But no matter how much I love square dancing, I’d never think of mixing it with baseball. However, that’s just what happened in this week’s typo Tuesday photo. 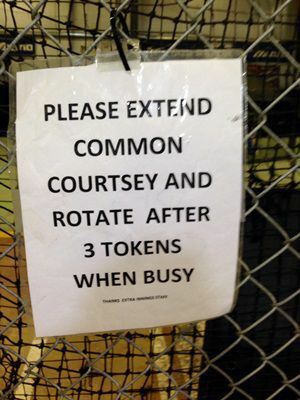 In the above sign, “courtesy” is misspelled as “courtsey” which, when pronounced, sounds just like “curtsy” to me! From this sign, I believe that I’m supposed to curtsy and spin with the other batters. Doesn’t sound like any batting cage I’ve ever been to, but I’ll try it! The main lesson here is to always make sure the spellcheck on your computer is turned on. In Word, sometimes spellcheck is automatically turned off for content that is in all caps, so double check to make sure yours is turned on for all content! “Courtsey” isn’t even a real word, so it would have been caught. And, also, don’t always do what the sign says. It could make for an awkward—although entertaining—day at the batting cages. Time Travel and Body Swapping: It's Not Science Fiction, It's Bad Content Writing!